Medical devices are more common in American society than one might believe. Seventy million Americans have a medical device implanted within their bodies. Even the doctors implanting the devices often fail to appreciate how loosely regulated this industry is. No wonder these very same devices can cause injury and pain, and lead to death. The surgical mesh used for hernia repairs can result in severe and deadly complications. Of people receiving surgical mesh, nearly a third required additional surgery or experienced complications, according to a 2016 study. More recently, court filings show that consumers have filed more than 50,000 lawsuits against manufacturers of mesh implants. Prior to the sale and use of any medical device, it must undergo review by the FDA for safety and efficacy. In recent years, the process for getting medical devices to market has accelerated as manufacturers push for faster device approval and less rigorous examination. Frequently, the FDA clears a new device, prosthesis, or implant based on “substantial equivalence” to an existing device that is already FDA-approved — including devices that may have been recalled. This means that products may be cleared for sale by the FDA without undergoing any independent testing. When manufacturers changed the design of the mesh devices used in hernia repairs — those changes were fast-tracked due to their supposed “substantial equivalence” to other devices and not tested. Furthermore, many medical devices are not tested in humans. Those that do receive testing often undergo trials lasting only a matter of months. In some cases, the design of the mesh implant was never tested for the purpose in which it was used. How Does Hernia Mesh Fail? Hernia mesh, composed of synthetic materials such as polypropylene, is used by doctors to provide support to a patient’s weakened or damaged muscle tissue where hernia bulges have developed. More than 90 percent of abdominal wall hernia repairs (including inguinal hernias) are performed using hernia mesh. This type of medical device is considered to be a permanent implant. Experts link these complications to hernia mesh implants. 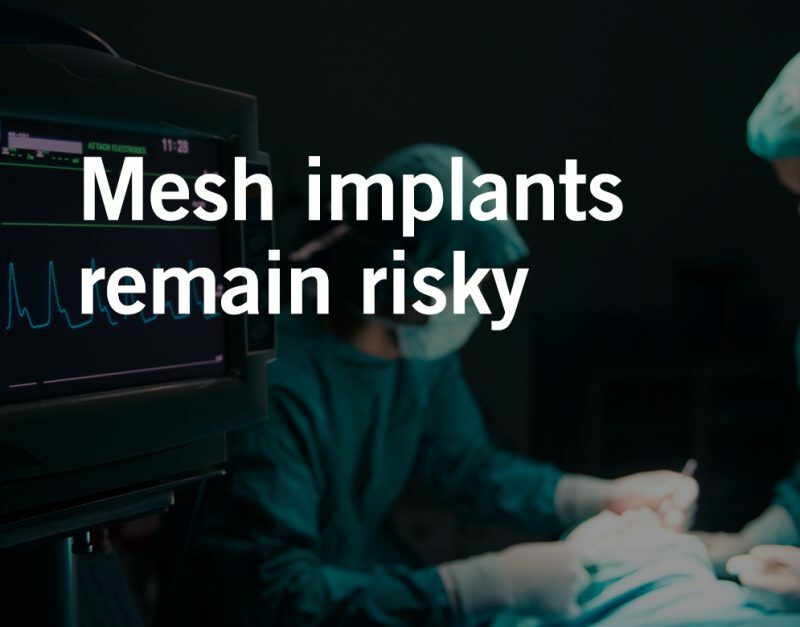 Many of the pending lawsuits ascribe the current complications experienced by patients to the manufacturers and the design of the mesh implant. As the choices for hernia treatment can have lasting effects, it is important for patients considering any procedure to be fully educated and speak with their doctor to explore the best options for their situation. Waters Kraus & Paul has been representing people injured by dangerous products and unsafe medical devices for over 20 years. We treat our clients with the utmost compassion while aggressively representing their case. Our clients are not just case numbers, they are real people — and we stand with them until justice is done. Have one of our medical device lawyers review your potential hernia mesh case, contact us by email or call 800.226.9880.